Oh, the joys of Summer in sub tropical Queensland. Before you get envious of the brilliant blue skies and sunshine let me tell of some of the other 'joys'. the cockroaches and the snakes. I can't believe that I now accept this as part of everyday life here. I'm not saying that I accept it as in I like it, it's just that I know it happens! This time of year we call in the pest man for his annual inspection for termites. We live in a timber house and this is just part of the maintenance to protect ourselves from our home being potentially eaten and turned to dust by these horrors. At the same time as the inspection, the pest man will spray our place with magic stuff to keep the spiders and the cockroaches out...what a hero! "Hmm, Beth - we have a bit of a snake issue here!" "Snake issue? ..... How big a snake issue?" where the electrician was connecting some power. He thought it was a piece of rope and got the shock of his life when the 'rope' moved! ﻿I stayed a safe distance away to weigh up the situation and offer my 'expert advice'!! - i.e.quick scarper indoors to watch out of the window. In conclusion - the snake didn't win the battle with the shovel and was placed in a strong plastic bag. The plastic bag continued to move for quite some time! I know, disgusting isn't it? Even though the poor snake was in a few bits - each little bit moved! Yuck! or as we would say in Wales - "ych y fi, mochyn du, rhedeg lawr i ty mamgu!" 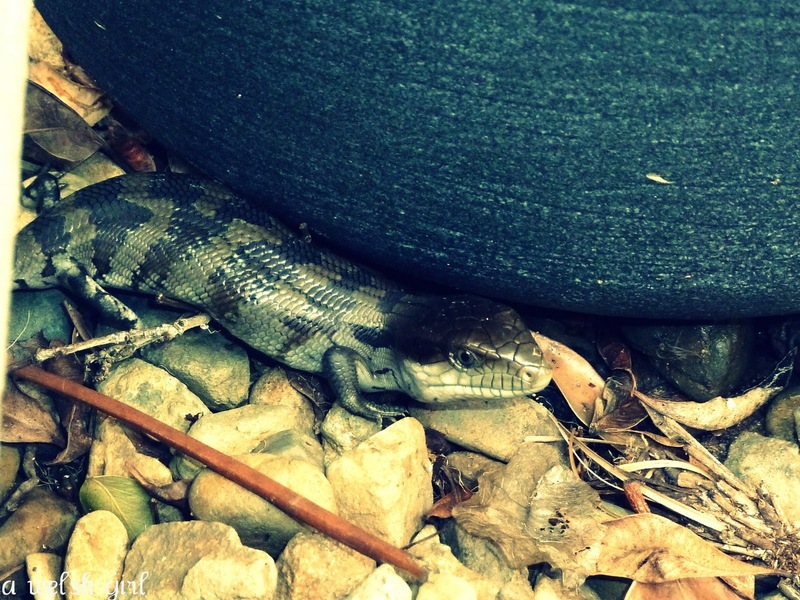 Then a couple of days after the snake incident Sibs spotted a blue tongue lizard in the garden. They look remarkably like snakes until you take a second glance and notice that they have little legs. even though it is putting on its sternest 'don't mess with me' face! We just watched it for a little while and let it go its own way. A bit of a reminder to be aware of what could be lurking in the back yard during the warmer months. Yikes Beth! Even reading about this in our winter wonderland scene here made me shiver...I love to go to Oz but snakes are not appealing, not at all....Thanks for sharing this! Oh I don't miss the cockroaches one bit! 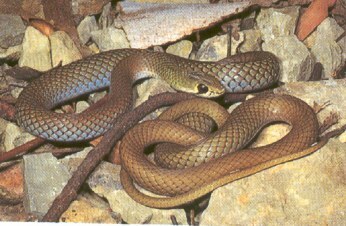 We lived in a bushy area of Ferny Hills for 4 years and not once did we see a snake at our house, much to Hans' disappointment, I think he was dying to tell all his friends and relatives that he lived in a snake-infested house in Australia! My Dad is a snake-catcher in FNQ, he has many many tales to tell (pythons eyeing off newborn babies in their cots kind of thing....) Eeeeeek! Eeek! I dislike snakes greatly! Can handle the blue tongue lizards but the snakes. No thanks!